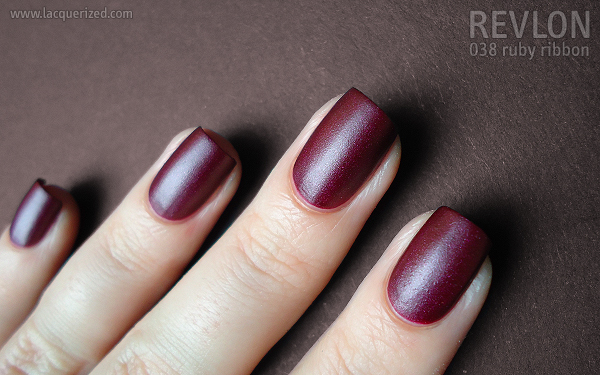 To accompany this Dutch rainy fall-esque weather I've got one of Revlon's shades for fall for you. Revlon is releasing two new shades this fall/winter, called Emerald City and Ruby Ribbon. I'm guessing it's a Dorothy theme? Both shades are intense colored mattes with shimmer. Emerald City is a gorgeous emerald green, unfortunately this one won't be available in the Benelux. Ruby Ribbon is a gorgeous ruby red matte with shimmer. It dried a lot darker than I would've guessed by looking at the bottle, but it's absolutely pretty. It's a very classic color, nothing too wild, but it reminds me a lot of the elegance from the 1940s. I would definitely top it off with some pin curls if I knew how to make them! This is my first Revlon ever and I was quite surprised! Especially mattes can be tough to apply, but not this one. It wasn't too thick or thin, it had the right consistency and it went on without any problems. It did took 3 coats for complete opacity. I can't say much about the wear because I only wore it for two days, but I it survived without getting too much tip wear. Ruby Ribbon dries more to a satin than a truly matte finish. Personally I enjoy those flat mattes a bit more, but I'm loving this one nonetheless. The drying time isn't as fast as some other mattes I have, but at the same time, this is probably what's making application a piece of cake. Revlon Autumn/Winter Nail Enamel will be available in September, retail price will be 8,95 EUR. Available at Drogisterij.net. The product(s) in this post were provided to me by the manufacturer or their PR company for review. For more information please read my disclaimer.